There are very few things that get me frothing at the mouth the way controversy about handmade gifts does. I love giving handmade. I love that I spent time thinking of someone as I made the gift for them. I love thinking about how much they will enjoy the gift as I create it. I love picking out specific colors or components especially for the recipient. I love almost everything about giving handmade. Except the cost. Giving a handmade gift is insanely expensive. For example, I love making quilts. To buy fabric at a quilt shop costs me between $10-12 a yard. It takes about 5 yards of fabric to make a quilt top. Then another 3 or so for the back. Then $25 for the batting. And if I have someone else do the quilting, that's at least another $100. Even something "small" like jewelry is an expensive endeavor. Purchasing the materials and the stones to make a piece of jewelry adds up, especially when using quality materials like crystals, semi-precious stones, and precious metals. And then once the piece is complete, you still need to spend money to box and package up the piece! None of this factors in the time it takes to make a gift. How much do you get paid an hour? If a crafter's time is worth $15 an hour, then 4 hours of time would add $60 to the price of a gift. Those handmade gifts would get expensive, fast! More than anything else, the emotional value of a handmade gift is impossible to calculate. If I make something for you, I desperately want you to love it. I loved it enough to give it to you. It is a piece of myself, and does not come with a gift receipt. There is no way to return, exchange, or get a refund on handmade. To save time and money on Christmas gifts... I can just go to the store. Everything can be wrapped up with a gift receipt. And if I'm feeling especially un-creative, I can just give out gift cards. I'm so with you on this and hate that when you're known as "the crafty one" it's assumed you'll be making gifts for every occasion. Because we all have plenty of time & $ for the dozen gift occasions every year. A relative admitted disappointment that I bought, instead of made, her wedding gift this year, despite the fact I had to pay for myself & 3 kids to be in her out of state wedding and hosted her shower (which I promise was plenty crafty). 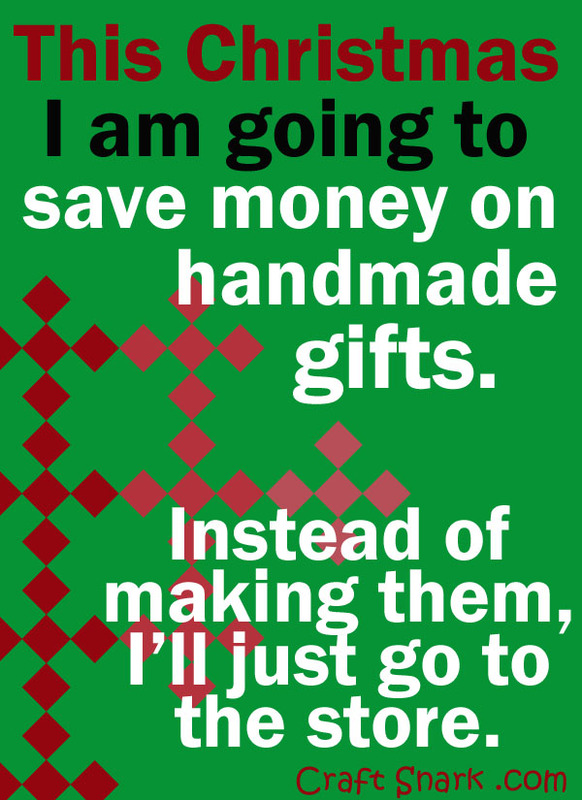 There's a huge incorrect assumption that it's somehow easier and cheaper for you to make a gift instead of just buying something like everyone else does. I'll be going to buying route this year - half of the stuff in stores these days is made to mimic handmade anyway, so I'd rather save the craft time & cash for something I want to make!